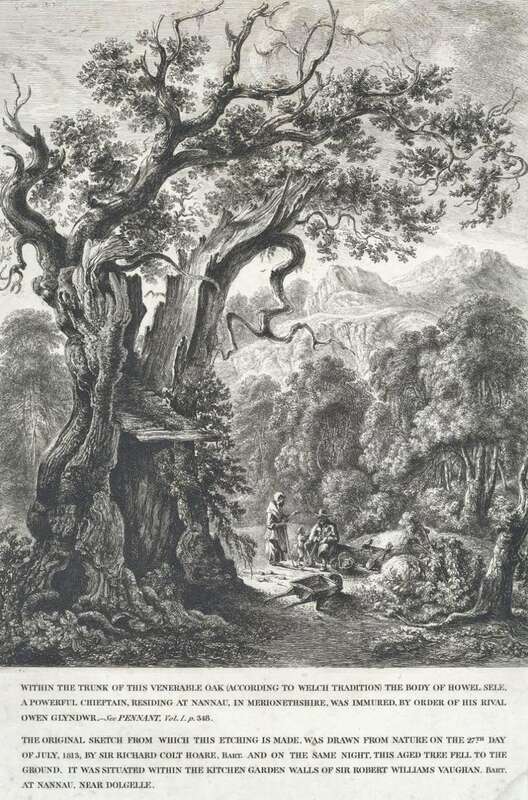 Within the trunk of this venerable oak (according to Welch tradition) the body of Howel Sele, a powerful chieftain, residing at Nannau in Merionethshire, was immured, by order of his rival Owen Glyndwr. See Pennant, vol.1 p.348. The original sketch from which this this etching was made, was drawn from nature on the 27th day of July, 1813, by Sir Richard Colt Hoare, 2nd Bart. and on the same night, this aged tree fell to the ground. It was situated within the kitchen garden walls of Sir Robert Williams Vaughan, Bart. at Nannau, near Dolgelle. The text from the print has been reproduced, (including the mispellings). Image © National Trust / Susanne Gronnow.